We provide a full range of damp proof creams in handy kits, 400ml tubes and in 1 Litre trade packs. 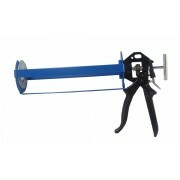 We have all the tools and equipment for you to install a chemical damp proof course on your property. Using our best selling Dampout+ damp proof cream is easy - just have a look at our How to Install Damp Proof Cream guide to see for yourself! If this is your first time damp proofing then you may be interested in out Damp Proofing Kits, which include everything you need to damp proof your property. 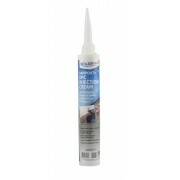 If you are trade customer, check out our 1 litre damp proof cream multi pack deals for the best prices on the internet. DampOut+ Damp Proof Cream is our advanced, chemical damp proof treatment for Rising Damp. 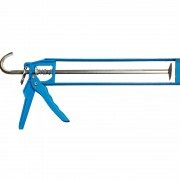 The Damp Proof Cream is easily installed by injection into holes drilled into walls using a standard caulking gun. 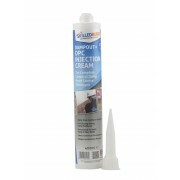 This Damp Proof Cream can be applied inside behind the skirting boards or externally through the brickwork. 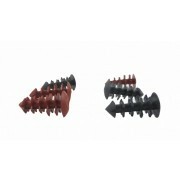 This product is easy to use and great for DIY . DampOut+ is our advanced, concentrated siloxane damp-course injection cream which stops rising damp dead. It is suitable for brick, stone and masonry walls and can advantageously be applied from either inside or out. 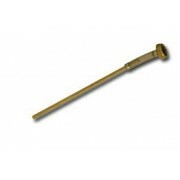 This product is ideally suited for walls with existing damp problems and walls are already wet. 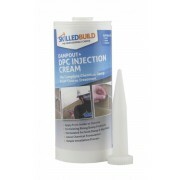 Our Damp Proofing Cream is our advanced, concentrated siloxane damp-course injection cream which stops rising damp dead. It is suitable for brick, stone and masonry walls and concrete block and can advantageously be applied from either inside or out. This is your DIY Solution to your Rising Damp! Damp in buildings is the presence of unwanted moisture in the building structure caused by the ingress of moisture from outside the building, internal escape of water, or condensation of water vapour within the building. Damp is a widespread problem affecting many properties across the UK. Damp can cause aesthetic and structural damage. Dampness also encourages mould growth and rot, which can pose significant health risks. Damp Proofing is the process of preventing ingress of external moisture into a building. This process starts with identifying the source of the damp problem in order that the appropriate remedial treatment can be installed. Penetrating damp is the horizontal ingress of moisture through porous walls. Penetrating damp normally presents on external walls in the form of isolated patches of damp, which increase in size after heavy rain fall. To avoid penetrating damp, regular maintenance of the building should be undertaken. Treatment of penetrating damp involves the identification and repair of the source of the damp, for example, damaged flashings, cracked pointing or render or damaged drainpipes. Micro porous water repellent, integral waterproofer, waterproofing membranes, waterproofing tape and tanking slurries may also be useful in keeping a building free from penetrating damp. For more information, see our How To Identify and Treat Penetrating Damp guide. Condensation occurs when warm air comes into contact with cooler air or a surface with a lower temperature. The temperature change results in moisture in the air condensing from a gaseous state into liquid. Condensation is best identified a small beads of moisture on non-absorbent surfaces. The solution to condensation is controlling the relative humidity of the building and surface temperatures, and by balancing heating with ventilation. For more information, see our How To Identify and Treat Condensation guide. Rising Damp results from the upward capillary movement of ground moisture into porous walls, generally through the mortar beds. Rising Damp can generally be identified by a tide mark or damp line on the internal surfaces of the wall up to a height of approximately 1 metre (3 feet); patches or areas of damp and staining; and salting may be present. Whilst some modern building had an impermeable membrane installed during construction to prevent the rising damp through the walls, it is possible for these to be damaged or fail. Older buildings are not likely to have had a physical damp proof course installed leaving them vulnerable to rising damp. To protect properties with no existing, or a damaged damp proof course, it is possible to install an impermeable barrier to stop the upward movement of rising damp by installing a damp proof cream. The damp proof cream is simple to install and does not require specialist skills or equipment. The damp proof cream is installed by injection into holes drilled along a mortar course at the base of the walls. Chemicals in the damp proof cream than diffuse through the mortar spreading a water repellent resin. This layer creates a water proof barrier to rising damp. For detailed installation instructions, see our How To Install Damp Proof Cream guide and How to Identify and Treat Rising Damp guide for more general information.